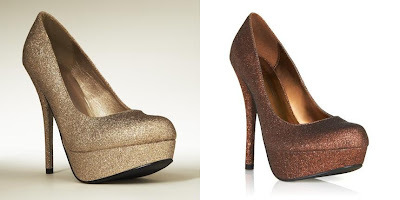 A while back, JustFabulous brought us the Cassidy glitter pump in black and gold. I am not a fan of gold so without second guessing it, I went right for the black. Both colors sold out very quickly. Those who did not purchase Cassidy hoped that JustFab would restock them. Unfortunately, it isn't very often that JustFab restocks items. The reason for this is because styles and trends are constantly changing and they try to offer new items each month based on these trends. Well guess what? Glitter shoes are a trend for Fall 2011 and Cassidy in gold and bronze popped up in this month's JustFab boutiques. Like I said I'm not really a fan of gold, but since I can't seem to get around not wearing it (hardware on bags, jewelry, etc) I've been trying to add a little more gold into my life. So the other day I snagged a pair of the gold ones. I figure that if I don't, they will sell out and I will wish I had! I've never really been a fan of glitter because I think that it often looks tacky. However there is something about pretty, sparkly things - we can't get enough of them!! Below are a few pictures of my black ones. They've been out for drinks with the girls worn with jeans and a tank top, bangles, cuffs, and statement earrings. Cassidy has also been paired with a nice dress, a silver charm necklace, and diamond studs for a party. I even wore them to work and straight through the day to the WhoWhatWear/JustFab event with a gray jeans and a simple black top. As you see, they can be styled many different ways and worn for all kinds of occasions. This picture of my friend Jen's gold pair is what ultimately sold me on them. Aren't they so pretty? If you are already a JustFab member, to purchase Cassidy simply use the search feature in your boutique to find her. If you aren't yet a JustFab member, you can get these shoes or any other item for just $19.97 (which is 50% off) with FREE shipping by signing up and placing your order within 24hrs of opening your account. I am hoping to have my gold Cassidy by next week so be sure to check back for additional pictures.